Originally posted on 26 May 2018. Scroll down for news of the 1.5 update. Wysilab has released Instant Terra 1.1, the first update to the 3D landscape generation tool since its release, adding new noise-based generators, support for colour maps, and new options for generating masks. Released earlier this year, Instant Terra is designed as a fast, lightweight tool for creating terrain, particularly for real-time work. The development team comes from a background in game development itself, with CEO Alexis Vaisse having been lead programmer on Ubisoft’s in-house physics and cloth-simulation systems. Workflow is primarily graph-based – the initial release included over 50 separate nodes, including a hydraulic erosion system – with the option to paint masks to control the effect of nodes. 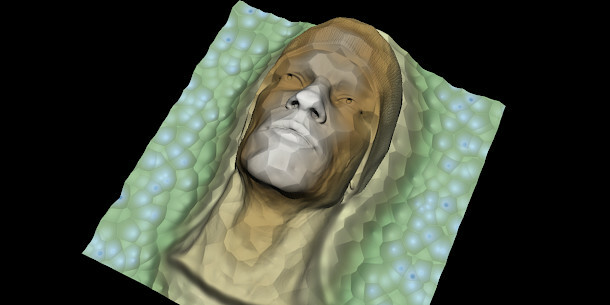 The software imports DEM data or source images, and exports terrain as an FBX mesh or heightmap, supporting a range of common 2D image formats including OpenEXR. Users work directly at the final resolution of a terrain – which can be up to 64K x 64K in the Enterprise edition – with changes displayed in a 3D preview in real time. To that, Instant Terra 1.1 adds two new terrain generators, Ridged Noise and Billowy Noise, both based on the Perlin noise algorithm, and intended to produce hills and ridge crests. Users can also now work with colour maps on terrain – blending two terrains also blends their surface colour – and generate masks automatically from the orientation or curvature of a terrain. There are also new Min and Max nodes, which take the minimum or maximum values of input terrains; and the option to create a mask by comparing the elevation of two input terrains. Updated 2 September 2018: Wysilab has released Instant Terra 1.2. The new update introduces an experimental new rock erosion system, still officially in beta. The new node simulates the movement of sediment due to gravity: a geological process referred to as thermal erosion, thermal shock, material slippage or talus deposition. The hydraulic erosion system gets an update, with new presets for common types of weathering, plus the option to export the flow map generated by the simulation as a mask. There is also a new set of Calculation nodes designed to perform basic mathematical operations; and new nodes to multiply masks or adjust their minimum and maximum values. New output options include the ability to export normal maps in TIFF, PNG, TGA or BMP format, and to export as tiles when working with large terrains. Workflow improvements include the option to create and colour code groups of nodes to keep a graph organised, and a new automatic backup system. Updated 4 December 2018: Wysilab has released Instant Terra 1.3. The update introduces the option to generate terrain from any imported 3D mesh, as shown in the image above. Import speed has also increased, probably quite significantly. Wysilab’s test case shows a 16GB import completing over 30 times faster: in 6.4 seconds, as opposed to 201.3 seconds in the previous release. Workflow improvements include a new Graph explorer panel that displays all of the nodes used in a scene. Nodes can be dragged and dropped from the explorer to the node graph itself. Updated 13 February 2019: Wysilab has released Instant Terra 1.4. The update adds a single feature, although it’s a fairly significant one for workflow: sub-sections of the graph can now be collapsed into new ‘component’ nodes, and exported for reuse in other scenes. Updated 5 March 2019: Readymade components can now be downloaded from Wysilab’s online library. At the time of posting, four are available, including tools for transferring detail from one terrain to another, a split view for comparing terrains side by side, and utility tools for working with masks. Updated 6 April 2019: Wysilab has released Instant Terra 1.5. New features include a mountain erosion node. It simulates the effect of rock weathering over time, and produces more uniform slopes and less sedimentation than the existing hydraulic erosion node. Other changes include the option to adjust the sun and ambient light when viewing a terrain, and the option to export 3D terrain in OBJ format, and masks in F32 RAW format. Instant Terra 1.5 is available now for Windows 7+ only. The software was originally rental-only, but Wysilab has now switched to perpetual licences for users with revenues under $500k/year. They cost $149 for 8K export; $199 for unlimited resolution. There is also a Pro edition aimed at larger studios, which includes features geared towards generating very large terrains, multi-file export, and a Python API. It is priced on enquiry.